From animated brooms zipping through the air to menacing suits of armor, lurching forward to bash intruders, from mechanical steeds to dancing statues, slithering rugs and aggressive wardrobes—all these, and so many more, represent constructs, a creature made by imbuing an ordinary object with magic to grant it locomotion and purpose, creating the semblance of life from unliving materials. Constructs can be found through the lands of Rûl, as laborers toiling in fields or hauling cargo from ships, or as guardians, set to protect priceless treasures. Some act as steeds, companions, and entertainers, or serve in myriad other roles and capacities. The reasons for their creation are as varied as the often-eccentric individuals who create them, and thus constructs come in all manner of shapes, sizes, and functionalities. 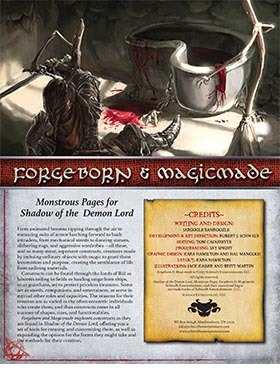 Forgeborn and Magicmade explores constructs as they are found in Shadow of the Demon Lord, offering you a set of tools for creating and customizing them, as well as expanding the options for the forms they might take and the methods for their creation. Grab your copy from Schwalb Entertainment or DriveThruRPG!